Memorial Day weekend in Texas can be a busy one for many. 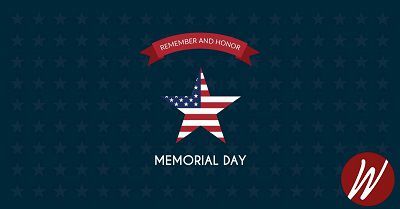 The three-day holiday that marks the unofficial start of summer is a great opportunity for family activities, which can leave little time for the original purpose of the holiday: honoring those who have died while serving in America’s armed forces. * Buy a poppy from the American Legion Auxiliary. The organization has been selling red crepe-paper poppies for Memorial Day and Veterans Day since 1925. John McCrea’s 1915 poem, In Flanders Fields, which honors those who died in World War I, inspired this tradition. * Display the American Flag. On the morning of Memorial Day, raise the flag to the top of the staff before lowering it to half-staff. Leave it at half-staff until noon, when you can once again raise it to the top. * Visit a Veteran’s Grave. The Department of Veterans Affairs (VA) maintains 131 national cemeteries, and many states have veterans cemeteries as well. Check the VA listings to locate a nearby cemetery, which will likely host a Memorial Day ceremony. We hope you’ll join us at Watkins Insurance Group in taking part in the moment of silence, known as the National Moment of Remembrance, and other Memorial Day traditions in honor of those who made the ultimate sacrifice for our country. We will forever be grateful for their service.